The last stitch in the binding for the Apple Core quilt was taken today. The border turned out even better than I thought it would. It looks like the middle apple cores were appliqued onto a border. The quilt turned out a bit smaller (43 1/2″ x 53 1/2″) than I thought it would, but that information will help me calculate the size of the next one. 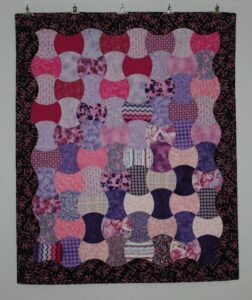 I have now machine quilted 9 of the 25 tops that is my goal for this year. Time to start on the next Long Time Gone block.